제당은 마을의 신앙의식을 행하는 곳이다. 인간의 일상생활과는 엄격하게 구분되는 성지의 일종으로 이곳에서 마을을 축원하는 제사를 지낸다. 장군봉과 마을 입구에 넓게 분포하는 삼덕리마을제당은 신을 모셔놓고 위하는 집(당집)과 여러 개의 신이 있다고 믿고 섬기는 대상물(당산)로 구성된다. 장군당 안의 장군신도(將軍神圖)와 2개의 목마 중 큰 목마, 원항마을 입구의 돌장승이 중요민속문화재로 지정되어 있다. 그밖에도 천제당과 당산나무 10여 그루, 나머지 돌장승 2쌍이 이곳의 동제당이다. 장군봉 정상에 위치한 장군당과 천제당은 각각 장군신과 천신을 모신 곳으로서 규모가 작고 조촐한 건물이다. 장군신화는 장군당 내부에 걸려있는 그림으로 갑옷과 투구로 무장한 장군의 단호함이 잘 표현되었다. 이 앞에는 목마 한 쌍이 나란히 세워져 있는데 큰 것은 원래의 철마를 도둑맞은 후 1940년경 새로 만들어진 것이고, 작은 것은 근처에 살던 일본인이 기증한 것이다. 장승은 대청·관유·원항마을 입구에 남녀 한 쌍으로 세워졌다. 관유마을의 것만 나무로 만든 목장승이고 나머지는 돌로 만든 석장승이다. 이 마을의 동제는 설날 첫새벽에 시작되어 며칠에 걸쳐 진행되는데 마을 공동으로 제사비용을 추렴하고 정성스레 음식을 준비한다. 마을에서 선출된 대표가 제관이 되어 몸과 마음을 깨끗이 한 후 제사를 주관한다. 천제당에서 천제를 지내고 장군당에서 장군제와 용마제를 지낸 다음 산기슭 바위에서 잡신제를 지낸다. 이때 쯤 각 가정에서는 조상제를 지낸 후 장승 앞에서 벅수제를 지낸다. 그리고 원항마을 당산에서 당산제를 지내며 어로의 무사고를 기원하는 별신제를 지낸 후 주민 모두가 어우러지는 풍물놀이를 끝으로 이 의례는 막을 내린다. 마을 전체를 위한 제사이고 마을의 구성원을 하나로 단결시키는 기능을 겸하고 있다는 점에서 의미가 깊다. 주민 전체가 참여하는 동제가 잘 보존되어있고 다양한 신앙 대상물이 공존하고있어 주목되는 이곳은 민간신앙, 마을신앙을 이해하는데 귀중한 자료이다. The shrine is a sacred place where villagers perform communal rituals to pray for blessings for their village. It remains strictly detached from the daily routines of villagers. The village shrine in Samdeok-ri is scattered around Janggunbong Peak and at the entrance of the village, consisting of dangjip (shrine halls) dedicated to deities and other numerous dangsan (village guardians). 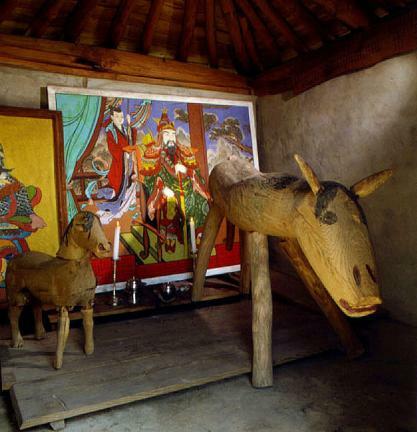 There are a portrait of a general, two wooden horses inside the Janggundang Shrine, and some stone guardian posts at the entrance of Wonhang Village as well as Cheonjedang Shrine, ten guardian trees, and 2 pairs of stone guardian posts. 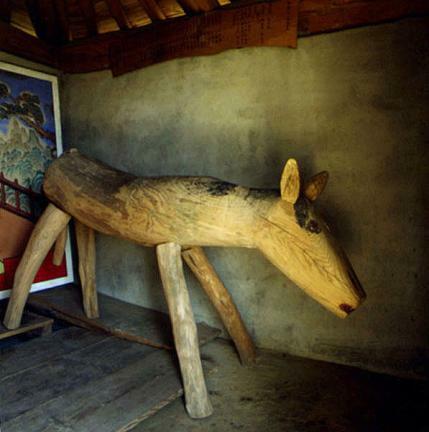 Among them, the mural, the larger wooden horse, and the stone guardian posts at Wonhang Village are designated as Important Folklore Materials. Janggundang Shrine and Cheonjedang Shrine perched at the top of Janggunbong Peak are rather small and cozy, dedicated to an admiral-god and a heaven-god. The portrait of the general is hung inside the shrine, depicting a stern general wearing a full suit of armor and a helmet. 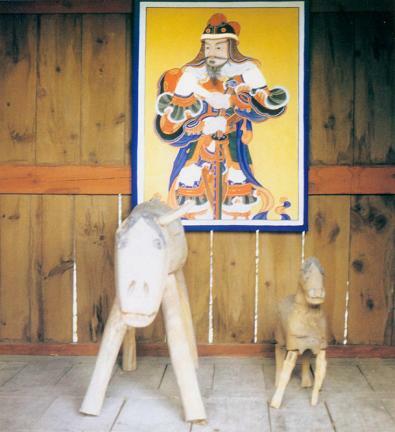 In front of the portrait, one pair of wooden horses is placed, the larger one of which newly made around 1940 after the original iron horse was stolen. The smaller one was donated by a Japanese resident living nearby. One pair of male and female stone posts is located at the entrance of each village: Daecheong, Gwanyu, and Wonhang. Only the pair at Gwanyu Village is made of wood, with the others made of stone. The communal rite in this village starts at the dawn of lunar New Year's Day and lasts for several days. Villagers would share the cost of the ritual and prepare food with utmost care. A chosen delegate presides over the rite after cleansing his mind and body. First, the delegate holds a rite for the heavens at Cheonjedang Shrine and the succeeding rites for a general dragon at Janggundang Shrine. He comes down to a rock at the foot of a mountain and holds another rite for other spirits. By this time, the rest of the villagers would hold individual ancestral rites in their homes and come out to the stone guardian posts for a rite for stone posts. This is followed by a rite for village guardians at the Dangsan site of Wonhang Village and a Byeolsinje (Village Ritual) to pray for safe fishing. When these series of ceremonies are over, villagers gather around and enjoy pungmul nori (traditional farmers' music) together. Since these communal rites are held to wish for the welfare of the village, they are vital in uniting all members of the community. Since the shrines have been well-preserved, and the rituals are still participated in by villagers, they offer valuable materials in studying folk religions and communal rituals. 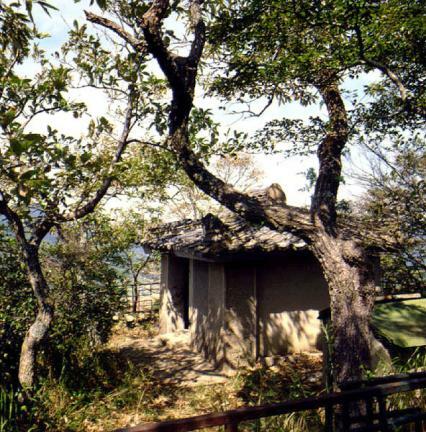 ※Change of the designated name: The name “The Town Shrine of Samdeok-ri” is changed to The Village Shrine of Samdeok-ri” in accordance with the name change planning of important folklore cultural heritage. (Feb. 18, 2005).